The new 34 series comes in 27.5, plus, and 29er chassis. The 27.5 version can be had with 140mm or 150mm of travel. 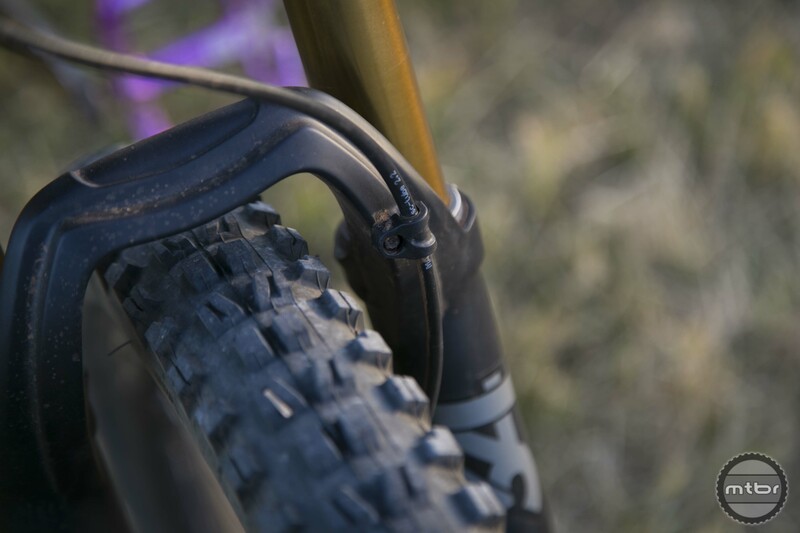 The 27.5 plus version is 120mm or 140mm. And the 29er ships with 120mm, 130mm, or 140mm. 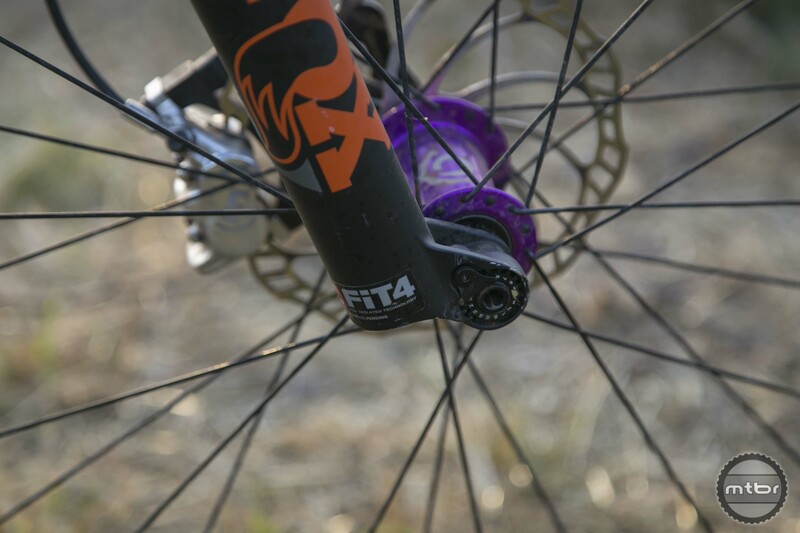 The 34 is Fox’s trail oriented suspension fork chassis. It was completely revamped in 2015 and now offers the functionality of a 36, but in a package that weighs just under four pounds. You could think of it as a 36 light. Same great taste, none of the bulk. For model year 2018, Fox has made what appear to be only minor changes, utilizing a new damper tune and updating the air spring. That doesn’t sound particularly impressive, but there’s a bigger story here. 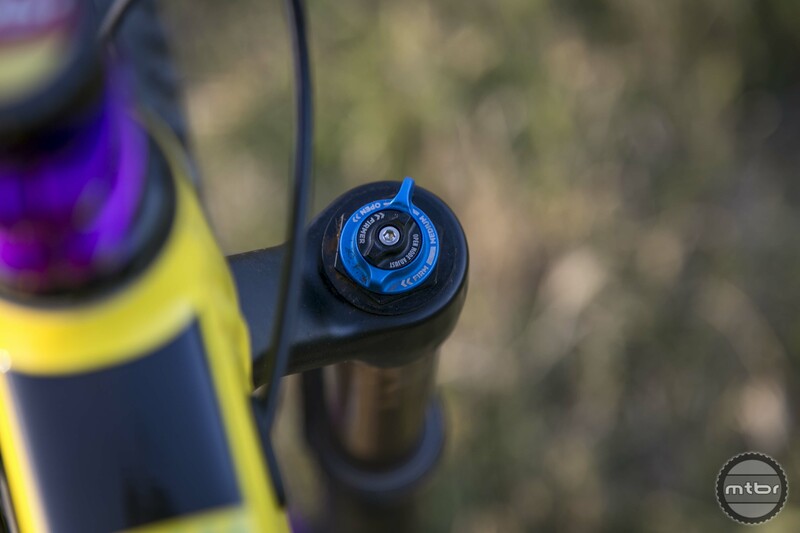 The new air spring is borrowed from technology that Fox first introduced in their rear shocks. You might have heard it to referred to as EVOL, which stands for “Extra VOLume” in the negative air spring. The blue line in the diagram represents a shock equipped with an EVOL negative air spring. During the initial part of the travel, the line is flatter, but ramps up midway through. By expanding the volume of the negative air spring, the initial travel becomes more linear. Around the 25% mark, you see an increase in mid-stroke support. In layman’s terms, that means the fork is smoother at the top and ramps up better than previous models. The concept is not new. Other competitors have applied similar technology in their rear shocks and we’ve seen a few brands adopt the technology for front suspension. While the new negative air spring appears to be effective on paper (and the dyno sheet), is it actually noticeable on the trail? Read on to find out. In the past, the rule of thumb for setting up a Fox fork (non-Talas) was to take your body weight, divide that in half, and get to pumping. With the addition of the EVOL technology, that equation has changed slightly. To achieve the same sag, you’ll need to add a few extra PSI. To help speed things along, Fox has now incorporated a sticker with base air pressure and rebound recommendations. Between the 2017 and 2018 series, base air pressure has increased slightly. On the 130mm travel 34 fork our final set up was 74 PSI, three volume spacers, six clicks of rebound, and eight clicks of low speed compression. 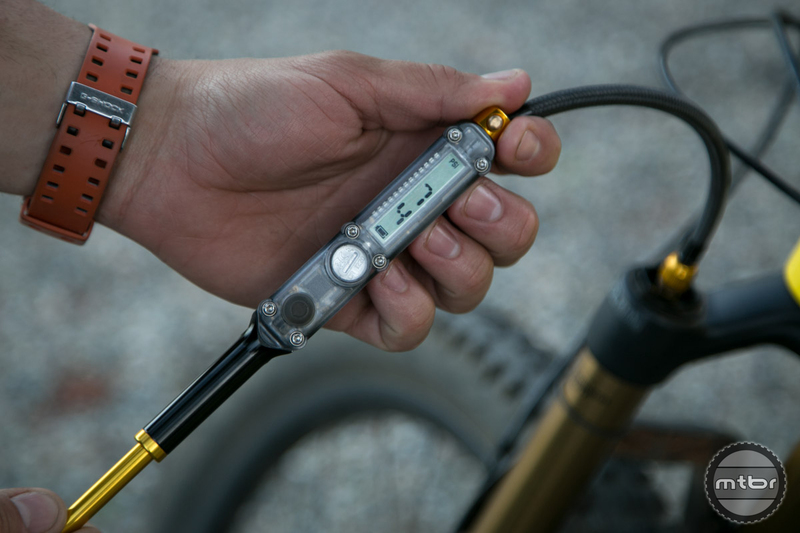 The Quarq Shockwiz gave us a shock tuning score of 96/100 with 100% confidence (in the playful setting). That’s on the lower range of Fox’s recommended PSI, but in line with their baseline rebound settings. For rougher trails, we’d probably back down the compression adjustment. Since our trails are relatively smooth and high speed, we prefer to have the fork ride higher in its travel. The EVOL sticker is the only indication that something new is going on inside. On the trail, the difference between the new 2018 series fork and its predecessor are subtle. 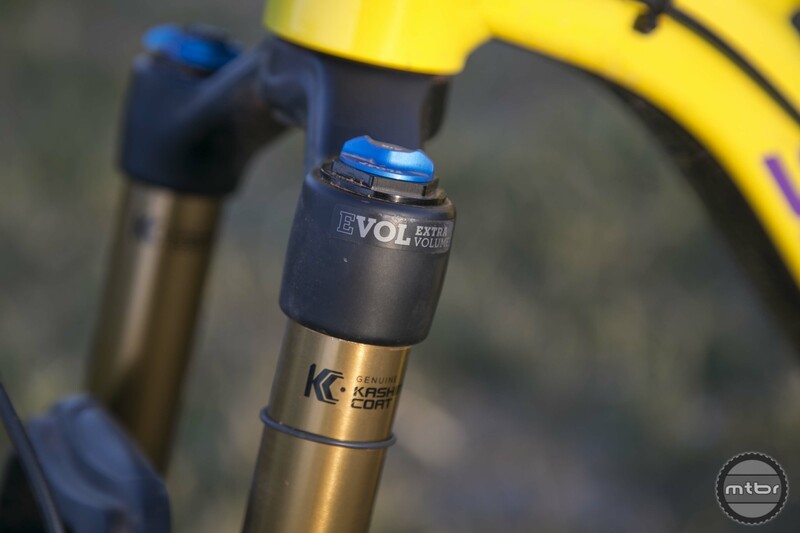 We felt the previous iteration offered impressive small bump performance, but the EVOL equipped fork is noticeably smoother through chatter. In the open mode, there are 18 clicks of compression. We set our fork about halfway in. 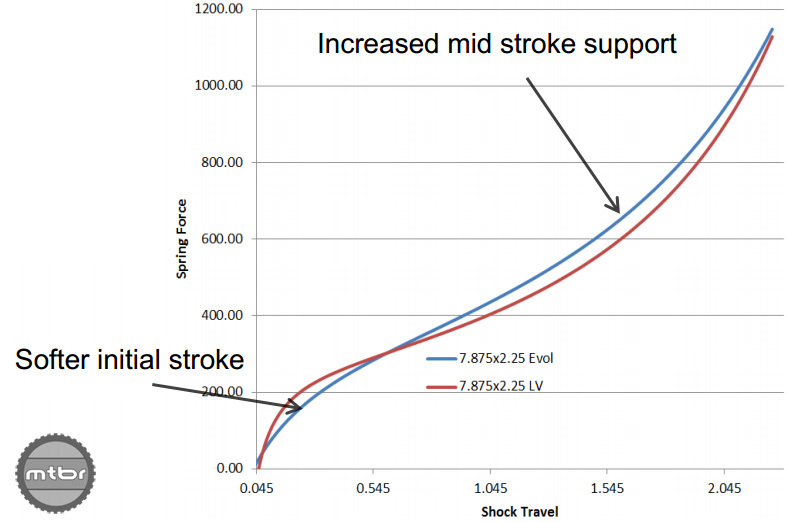 Perhaps the biggest improvement, however, is the increased mid-stroke support. With the new EVOL spring across both the 34 and 36 chassis, we’ve been averaging one to two less air volume spacers. Combined with the high tunability offered by the compression adjustment, our hands have never been happier. How do air volume spacers? Learn more in our detailed review here. The 34 series is available in four different trim levels, although the Rhythm series is not available aftermarket. The base level Performance model retails for $740 and ships with a FIT GRIP damper. For about $60 more, you bump to the Performance Elite level. This model is essentially a murdered out version of the Factory series fork, which sits atop the Fox pantheon. If you want the best, be prepared to shell out $880. Kashima coating doesn’t come cheap. 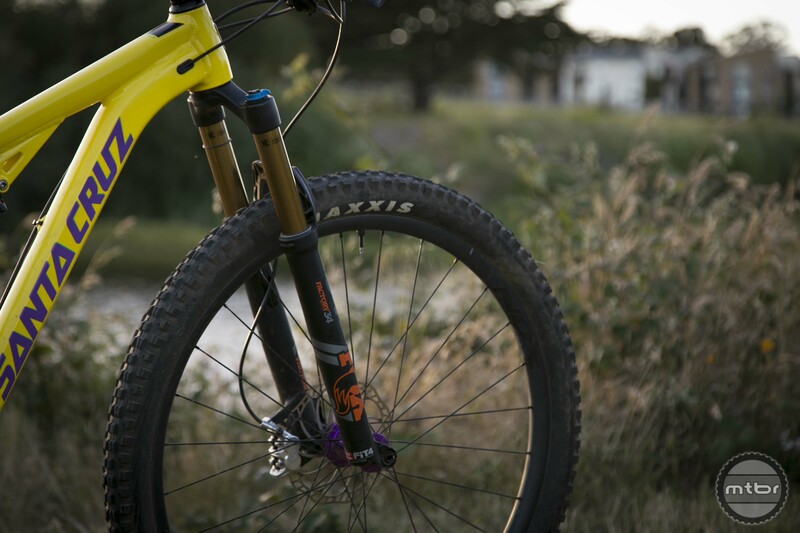 The Fox 34 is one of the best forks in its class. 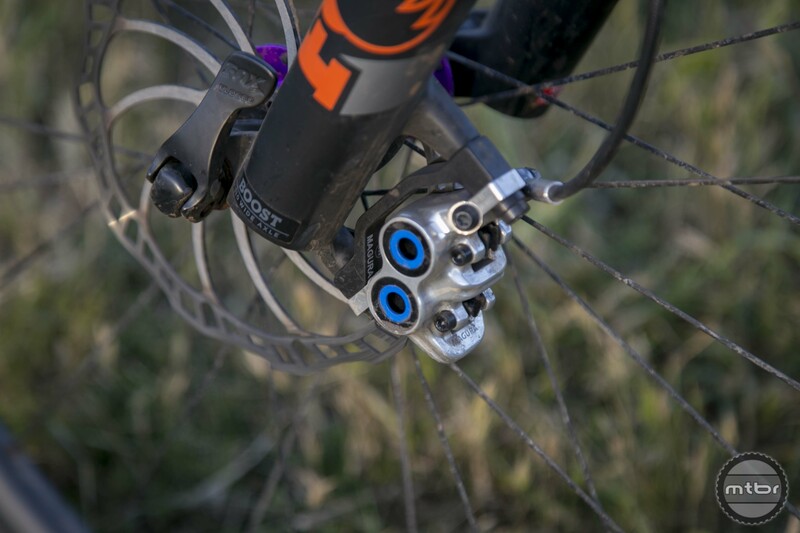 If you are currently on a newer 34 chassis, should you upgrade to a newer EVOL equipped fork? While you’ll probably notice the subtle performance gains, we’d suggest holding off. 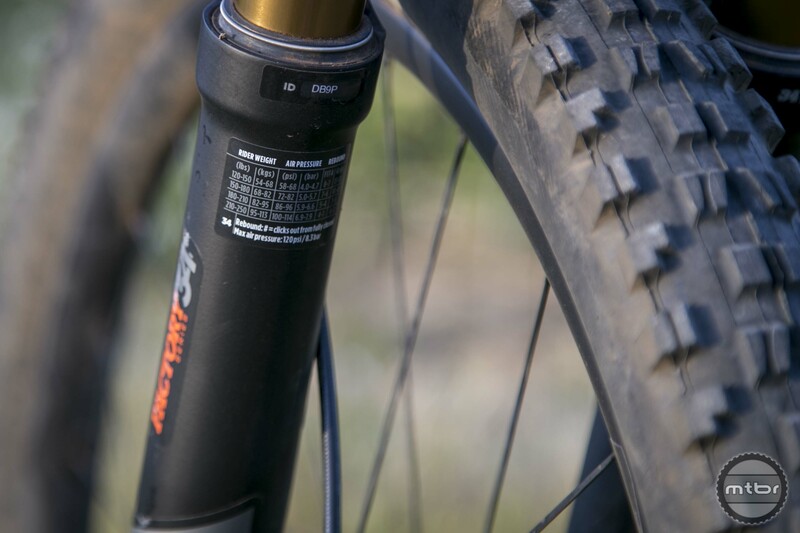 If however, you are riding a cheap OEM fork or older model, the answer is easy. The new 34 retains the same weight, stiff chassis, and low axle-to-crown that made the previous model so good, while adding improved small bump sensitivity, increased support, and better overall tunability. The 34 series is available in 27.5”, plus, and 29” specific chassis. The 27.5” version can be had with 140 or 150mm of travel, while the 27.5 plus version gets 120 or 140mm of travel. The 29” ships with either 120, 130, or 140mm. In the open mode, there are 18 clicks of compression. We’ve set our fork about halfway in. The 34 is one of the best forks in the class. The blue line in the diagram above represents a shock equipped with an EVOL negative air spring. During the initial part of the travel, the line is must flatter, but ramps up midway through. If you have a 2017 model, couldn’t you just upgrade the air spring to get 2018 performance? 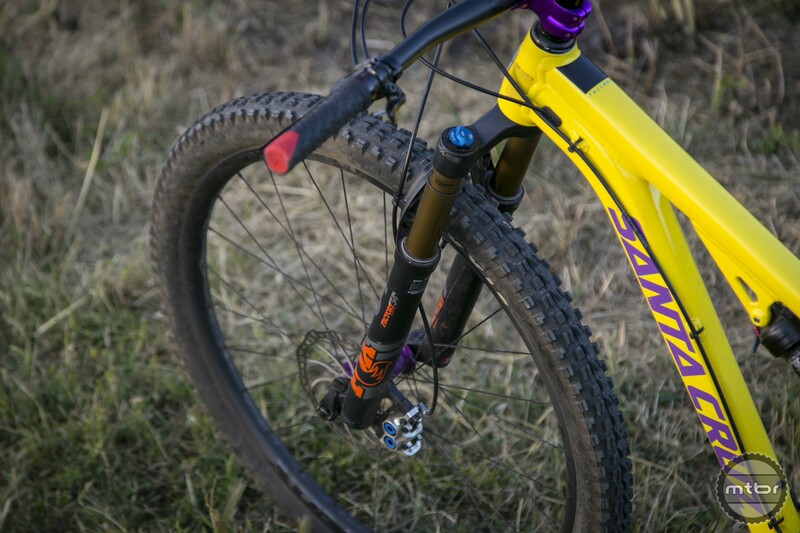 I would like to have some more information on the FOX 34 fork and the Alloy Tallboy it is on. I have the same bike but interested on the build of this one as well.